Another weekend is coming up ahead which some of you may be spending quietly at home, sitting behind your laptop screen or smartphone and playing Bitcoin casino games. If those are your plans for this weekend, you might want to check out Cloudbet Casino this Friday where new HD Bitcoin slots have just been added. And if you’re feeling like you’re up for a bit of a competition instead, you can check out BetChain’s new Blitz slot tournament. Cloudbet Casino has just added a number of popular Bitcoin slots for its regulars, including a couple of Microgaming’s hit titles. The first of these is the funky Wacky Panda from Microgaming, which is a vibrant 3-reels game with only 1 payline and a top payout of 3,333 coins. But if you’re not into classic slot machines, you can also find a few new 5-reels games at the casino. Namely, Cloudbet has also added Microgaming’s mega-popular Jurassic Park slot which was licensed from the 1993 hit movie. Not only does this 243-ways slot game feature impeccable graphics and characters from the film, but it is also bursting with free spins rounds and other bonus features. And to make things even more exciting, the slot requires of you to progress through each bonus feature by playing more, giving you a shot at hitting a total of 475,000x during your session. Apart from these 2 slots, Cloudbet now also offers the stunning Sand Princess slot from 2 by 2 Gaming as well as the creative Baker’s Treat from Play’n Go. And these slots are all available alongside dozens of other modern and classic slot machines from the casino’s game collection. To see the full list, just visit Cloudbet Casino. Like every month, BetChain has once again launched a new leg of its Slots Blitz Casino Tournament. 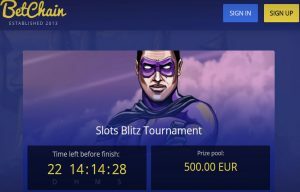 One of the easiest Bitcoin casino competitions online, the Blitz tournament at BetChain has no special entry requirements. You don’t need to ask for any registration forms and you don’t need to spend hours analyzing any fine print. The only thing you “have” to do to enroll is to play some of the selected slot games and you’ll be eligible for claiming one of the five prizes. The tournament will last until the end of the month, or 22 days from the time of writing. Whoever spends the most on the selected slot games during this period, will get to claim a 1st place prize of €200 to withdraw in any available currency equivalent. The second and third positions on the leader-board offer prizes of €100 instead. And the last 2 positions (places 4 and 5) will get to win prizes of €50. The selected slot machines are all games from BGaming. Some of these slots offer more traditional gameplay while others, like the Johnny Octopus, feature more contemporary creative designs and bonuses. To see exactly which slots you can play during the June Blitz tournament, you can check out BetChain Casino.